Technology companies have known for some time that the evolution of their products, whether they're laptops, cell phones or electric cars, depends on the steady improvement of batteries. Technology is only "mobile" for as long as the battery allows it to be, and Lithium-ion batteries—considered the best on the market—are reaching their limit for improvement. 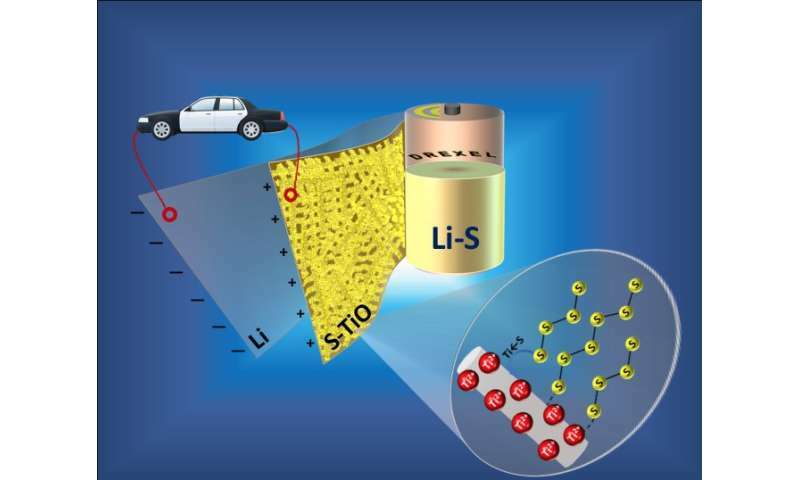 Researchers and the technology industry are looking at Li-S batteries to eventually replace Li-ion because this new chemistry theoretically allows more energy to be packed into a single battery—a measure called "energy density" in battery research and development. This improved capacity, on the order of 5-10 times that of Li-ion batteries, equates to a longer run time for batteries between charges. "We have created freestanding porous titanium monoxide nanofiber mat as a cathode host material in lithium-sulfur batteries," said Vibha Kalra, Ph.D., an assistant professor in the College of Engineering and lead author of the research. "This is a significant development because we have found that our titanium monoxide-sulfur cathode is both highly conductive and able to bind polysulfides via strong chemical interactions, which means it can augment the battery's specific capacity while preserving its impressive performance through hundreds of cycles. We can also demonstrate the complete elimination of binders and current collector on the cathode side that account for 30-50 percent of the electrode weight—and our method takes just seconds to create the sulfur cathode, when the current standard can take nearly half a day." 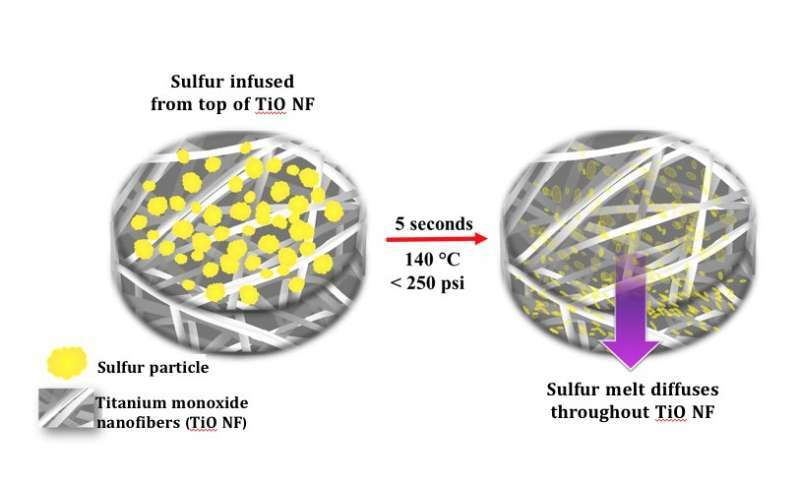 "This research shows that the presence of a strong Lewis acid-base interaction between the titanium monoxide and sulfur in the cathode prevents polysulfides from making their way into the electrolyte, which is the primary cause of the battery's diminished performance," said Arvinder Singh, Ph.D., a postdoctoral researcher in Kalra's lab who was an author of the paper. This means their cathode design can help a Li-S battery maintain its energy density—and do it without additional materials that increase weight and cost of production, according to Kalra. In tandem with its work to produce binder-free, freestanding cathode platforms to improve the performance of batteries, Kalra's lab developed a rapid sulfur deposition technique that takes just five seconds to get the sulfur into its substrate. The procedure melts sulfur into the nanofiber mats in a slightly pressurized, 140-degree Celsius environment—eliminating the need for time-consuming processing that uses a mix of toxic chemicals, while improving the cathode's ability to hold a charge after long periods of use. Nice work not only in the electrochemistry but also in the electrospinning mechanical fabrication of a free-standing binder-free lithium sulfur electrode.